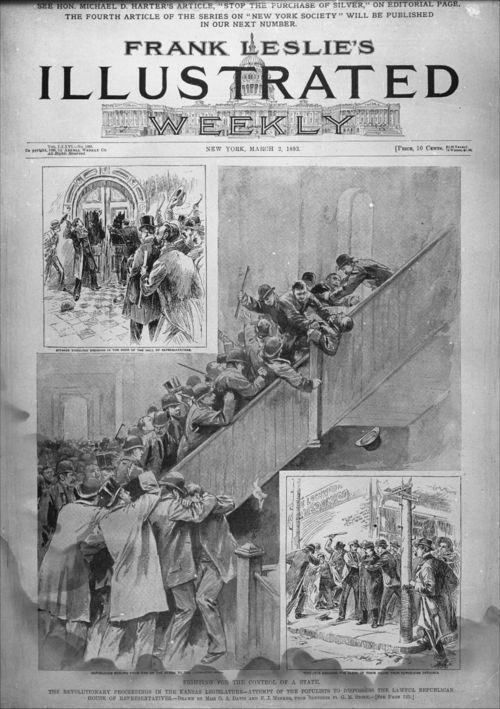 These illustrations depict the Populist War in Kansas as printed on the cover of Frank Leslie's "Illustrated Weekly." The dispute began when both the Republican and Populist parties claimed victory in the Kansas House elections in 1892. A number of contests were still being disputed when the legislative session began in January 1893. The conflict between the parties reached a crisis when the Populists locked themselves in the House Hall. The Republicans used a sledgehammer to break down the doors to the hall. The governor requested support from the state militia. After a three-day standoff, Governor Lewelling was able to negotiate an agreement with the Republican speaker of the house, which amounted to a Populist surrender. The state Supreme Court ultimately ruled in favor of the Republicans.